In a dental emergency, prompt treatment from a dentist is almost always required to alleviate pain and to ensure the teeth have the best possible chance of survival. 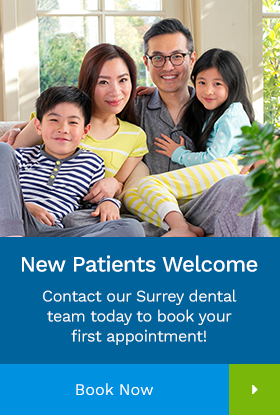 If you are experiencing a dental emergency, call our Surrey office immediately*. *After hours, please visit your nearest emergency room. Sometimes teeth become fractured by trauma, grinding or biting on hard objects. In other cases, fillings, crowns and other restorative devices can be damaged or fall out of the mouth completely. If there is severe pain, it is essential to make an appointment with the dentist as quickly as possible. The pain caused by dental emergencies almost always gets worse without treatment, and dental issues can seriously jeopardize physical health. When a tooth is knocked out of the mouth, tissues, nerves and blood vessels become damaged. If the tooth can be placed back into its socket within an hour, there is a chance the tissues will grow to support the tooth once again. If possible, place it back into its socket – if not, tuck it into the cheek pouch. Call the dentist to say you are coming in with a tooth that has been knocked out. Get to the dentist, quickly and safely.